Rice can be a great source of many valuable nutrients. So it makes sense that we should want to include it in our everyday meals. But no one wants to eat plain old chicken, veggies and rice for dinner every night. Dress up your mealtime with these simple ideas for new and improved rice side dishes. The easiest way to get a little extra flavour in your rice is by boiling it in something other than plain water. If all you have is a little bit of salt and pepper, that works. But for more of a change, cook your rice in broth. Chicken broth adds a lot of flavour to rice, and vegetable or beef stock work great too. Any rice dish can easily be improved by adding a little bit of spice to the cooked grains. If you’re a fan of foods with a kick, toss in a bit of paprika or crushed red pepper flakes. Or, for milder additions, include a pinch or two of spices such as cumin, coriander, garlic and onion powder. If spice isn’t your thing, simply including some parsley or cilantro can quickly jazz things up. A truly exciting rice dish doesn’t have to be just rice. For a sweeter side dish, mix dried cranberries and raisins in with dry rice and cook all at once. Or, if you’re having trouble getting your kids to eat their veggies, toss some peas, corn, diced onions and finely chopped carrots in the mix. You don’t have to use plain white or brown rice. Try black rice, red rice or wild rice for a completely new array of textures and flavours. Add some barley for a delicious grain combo; you can even add beans or legumes such as lentils and chickpeas for an added boost of nutrients. To really make rice a part of your meal, consider turning it into the main event. Rice sticks together well and can therefore easily be stuffed into vegetables or meats. For a healthy and delicious vegetarian option, create some stuffed red peppers. Or, if you’re more of a meat lover, try something along the lines of Cooks.com’s stuffed rotisserie chicken. 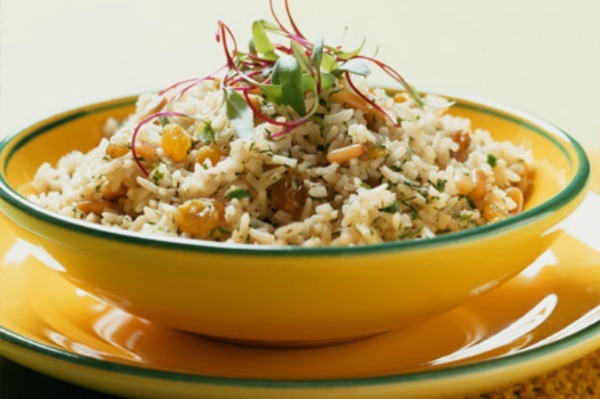 Rice is a great side dish because it can contribute a lot to your meal nutritionally. But in order to truly reap the benefits that rice has to offer, it’s important to choose your variety wisely. Wherever possible, stear clear of plain white rice, which has been ripped of many of its nutrients. Instead, give yourself time to adjust to the taste of brown or wild rice, which will do your body far more good. And with all these tips you’ll have a yummy and nutritious side dish in no time!